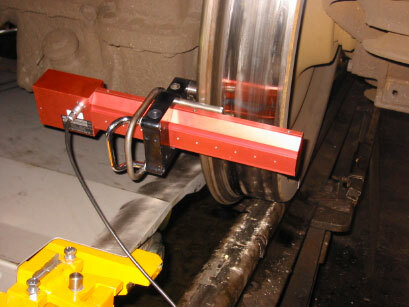 The system may also be used for the measurement of rail profiles. A portable, one person operated tool for the measurement of wheel profiles. Compact and robust the laser system measures quickly with a very high degree of accuracy. The profile geometry is scanned by a non-contact, battery powered laser system. The contour data is immediately available for analysis in the depot, workshop or siding. Further evaluations can be made using software after download from the hand-held logger. Monitoring of diameter differences of the wheels of the whole vehicle, the drives and the bogies. Wheels – one of the most important components of a rail vehicle, are exposed to high mechanical stresses and therefore have a decisive influence on the running behaviour of the vehicle. The wheel-rail system needs regular inspection to ensure reliability. The WPM11 ensures that the wheel profile data is measured with the highest degree of accuracy. The instrument is battery operated with a data logger as an input and memory medium. The assignment of the nominal and maximum dimensions for the respective profile type and its monitoring is fully database supported. Measurements on the wheel and assessment of wear can be performed quickly and easily. Long term analysis of the wear dimensions and profile inspections offer assistance in determining low-wear profiles. The optimum operating life of vehicles (before re-profiling) can be determined based on wear behaviour. The contour data of the wheel profile is immediately available for operator review in the depot or workshop. Further evaluations may be made using PC software after download from the hand-held logger. Wheel run-out can be measured when used in conjunction with a mobile wheel set turning device. The lifting device allows the axle to be raised and turned whilst in situ. The laser wheel profile measuring system can be attached to the axle rotating device by means of a special bracket. The run-out deviation is determined and logged by continuous laser measurement in the rotational plane during a revolution of the wheel. The continuous recording of the measurement also enables detection of flat-spot areas. Adapting the mobile wheel profile measuring instrument to a Bance Track Measurement Gauge allows measurement of rail profiles. The rail head profile can be evaluated using “Rail Measurement” software.